While Wednesday’s sale was a blinder, today’s somehow didn’t have the same atmosphere or consistency. Nevertheless, some good cars came under the hammer and went out to buyers. The silver 66k mile 2001/51 530dSE in the photo made £15,850, which was exactly what I’d mileage-adjusted it to. So it wasn’t the bargain a 42k mile 2002/51 530dSE Touring manual was at £16,500. But it’s the time of year when strange things can happen by pure chance. 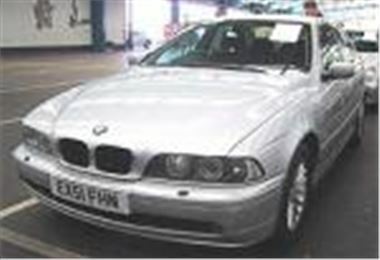 In the 72 car BMW sale on Wednesday, Joe from www.auctioncarbuyer.co.uk lost a 330d manual that went £1,000 over book. Then, 20 minutes later, he bought a 330d auto for £1,200 under book for his grateful client, simply because the rival bidder had already spent his money on the dearer car. A mixed bag of provisional bids on oddballs included £4,625 for a 79k 2000W Jeep Cherokee 2.5TD Sport; £13,600 for a 20k mile 2001/51 Chrysler Voyager 2.5CRD SE; £9,950 for an 85k mile 2000X BMW 330iSE manual; £9,000 for 114k mile 2001Y BME 520i SE 2.2 auto; £9,700 for a 76k mile 2000W Mercedes E240 Elegance estate with really bad paint; and £9,900 for an 18k mile 2002/02 Daewoo Musso 2.9TDI auto with leather. The Musso sold. Focuses have got a lot cheaper, mainly because they can now be four years old and there are so many of them around. Today a 90k mile 2000V TDI LX sold for £3,100 and a 121k mile 99V 2.0 Ghia 4-door bid to a mere £2,400. But it wasn’t a day to draw any hard and fast conclusions from. Better luck next week.